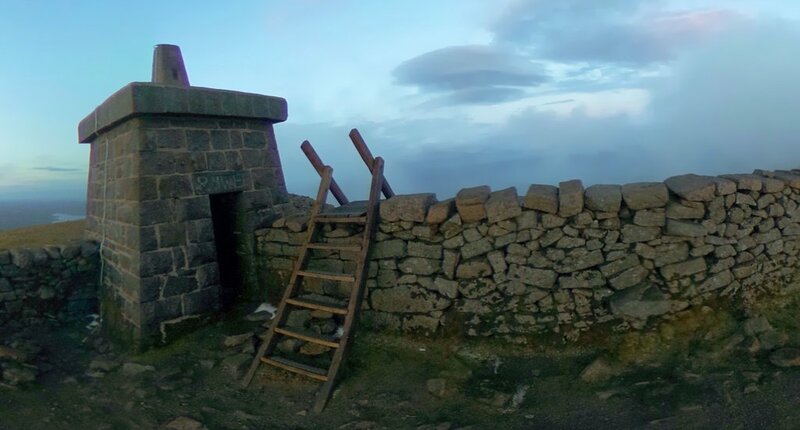 Explore the Slieve Donard from the comfort of your computer, tablet, smart phone with this virtual reality mountain tour of Northern Ireland's highest mountain. The tour supports Google Cardboard and other VR devices for your gyroscope enabled smartphone. Start tour from Donard Park. I hope you enjoy this virtual mountain experience. The panoramas where taken during my second outing to the Mourne Mountains one April evening in 2018. My earlier excursion had been in November 1999, and was now a distant memory. I arrived in Newcastle after a day of work, making sales calls in Cavan and Dundalk, and in the rain decided not to bother even leaving the car. But the wind quickly blew the rain rainclouds eastwards over the Irish Sea, so I turned my car around, changed into more suitable clothing and at seven pm headed south through Donald Park and into the band of forest that lies between the open mountainsides and the town. 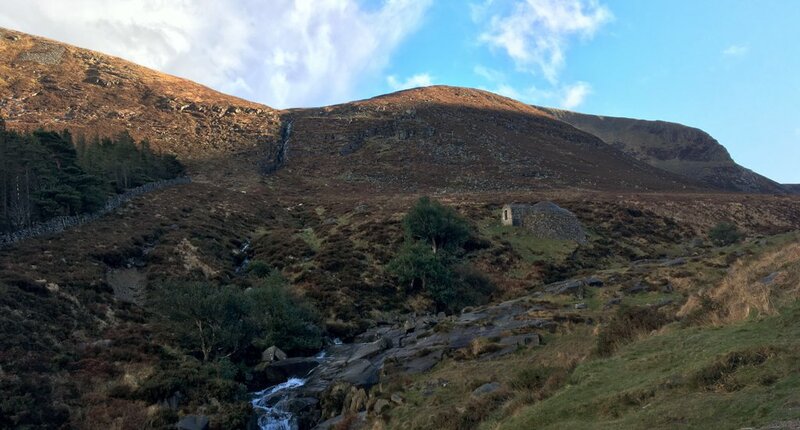 The Slieve Donard Trail follows the Glen River through the forest, the river flowed excitably after the recent rains, roaring over cascades and through gullies in it's eagerness to reach the sea. The path often obvious, was sometimes a little more testing to follow, the rocks, and worse still, the exposed tree routes were traitorously slippery. I made a note to take care on my descent, likely it would be in the dark. 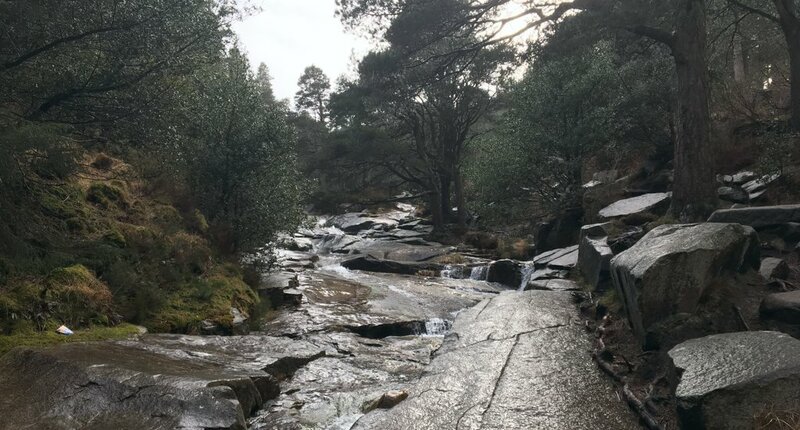 This now coniferous forest was once part of the Donard Lodge Estate, and previously consisted of a collection both native and exotic trees planted in the 1830's amongst architectural follies, bridges and seats. Little of this past now remains, the lodge, having falling into dilapidation, was pulled down in 1966. But as the trail follows the Glen River above the tree line, an unusual building hugs the slope on the opposite bank. The domed roof is an ice house, constructed around the same time as the hillside was landscaped and planted, once provided a source of refrigeration and ice during the summer months. The old Ice House and Black Stairs waterfall. This particular spot is familiar to millions of people across Britain, though not many would perhaps match it to the location. The BBC filmed a short intermission feature here; a group of fell runners emerge from the forest, pause to take in the view, the run towards the camera. It was one of many similar shorts shown between programs on the BBC during 2017 and 2018. 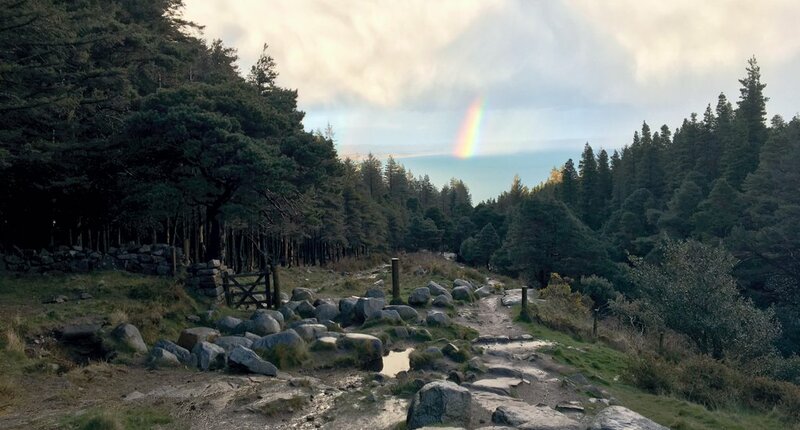 Rainbow above the Donard Forest and the Irish sea. The path continued along the forest edge for 15 minutes, boulder strewn and puddled, it felt like a important landmark had ben reached when at last I left the forest behind and was out on the open hillside, the slopes of Slieve Commedagh to my right and those of Slieve Donard to my left. As the path came closer to the ever narrowing Glen River the rain began to fall again, dark clouds blown north-eastward by a strong wind. Crossing the Glen River on stepping stones the rain became a deluge. Was now the time to turn back? It felt purposeless to continue on in the rain, climbing into the clouds that now hid the two peaks. I lingered, waited, then made the decision to continue on as far as The Saddle where I would meet the Mourne Wall. If there was no change in the weather then, I would head back down. If the rain cleared, as had been the pattern all afternoon, I would continue to the summit. I had yet to reach the wall when the size of the droplets lessened, then steadily their frequency declined. It was safe to fasten my Theta S 360 camera back onto the top of my trekking pole come monopod. At the wall I took another photo, the clouds lifting so that once again I could see the summits, the two familiar ones, plus new rocky tops south beyond the wall. I headed eastward, climbing alongside the 22 mile watershed in a beautiful golden light as the sun, for a moment free of cloud, sank to the western horizon. I hoped that the clouds would stay high enough until I reached the summit. But that hope was in vain, the wind blow in yet another cloud and Slieve Commedagh was hidden from sight. Exploration of the summit became necessarily brief, it was already growing dark. After visiting the tower I hurried back down to The Saddle and on to the Glen River in the twilight. Back on the forest trails it was dark, route finding difficult even by torch light. I slipped on the wet tree routes, gained a nasty knock on my thigh that would mark me with a huge black bruise for the next week. But with the roar of the river always at my side there was no real danger of getting lost, wet perhaps, but not lost.